If you design something and you are looking for the right font, it can take a lot of time. In word processing, DTP and (web)design programs, you can often only select one font at a time. Finding the right font often means searching through all your fonts. 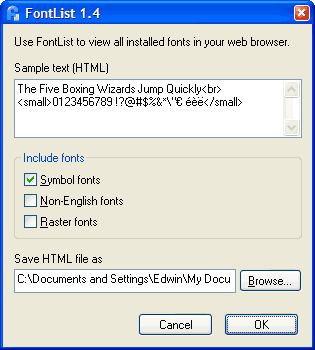 Using FontList, you can change the predefined sample text, exclude seldom used fonts from the list and change the path for the HTML file.